I went on a quick thrifting trip at the beginning of the summer, and I have been wearing some of these finds nonstop since then. 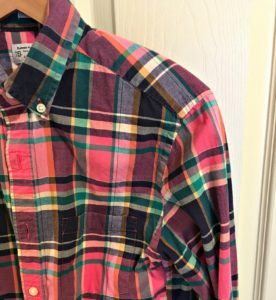 It seemed like a good time to put together a few things I’ve learned about thrifting over the years. 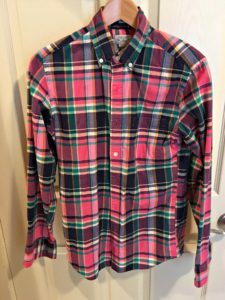 I’ve included brands of items even though I’m not much of a brand snob; I just think it’s interesting what you can find at thrift stores. Enjoy! 1. Go on half–off days. At my favorite thrift store, those are Wednesdays (for clothing, anyway). The tradeoff is that it’s much busier on Wednesdays, but I’m willing to wait in longer lines for better deals. 2. Think outside your department. Some thrift stores are better than others at sorting garments, but I can’t tell you how many times I’ve found women’s items mixed in with men’s and children’s. Button–down shirts and bermuda shorts often get mixed in with menswear, and small sizes often end up in children’s. I don’t spend a ton of time flipping through every single rack, but I do keep an eye out for mix–ups. I’ve also shopped menswear on purpose a few times. 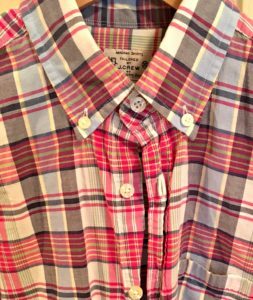 If you’ve followed any of my Project 333 posts, then you know that button–downs are a staple in my wardrobe. They’re easy to dress up or down, they layer well (under sweaters in the cold, over tank tops in the heat), and they just make you look put–together. Plus, I rarely bother ironing them in this humidity! 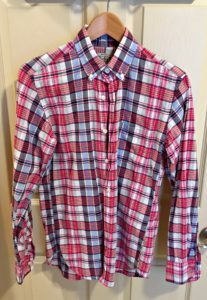 While men’s and women’s shirts are made differently in terms of slimness and darts, I’ve found men’s shirts that I really like. And now that I’m thinking ahead to a post–partum wardrobe, I’m embracing the idea of a loose, straight fit with no darts. On this trip, I was lucky to find two J. Crew slim shirts for men. Have no fear—they were nowhere near J. Crew’s price! They were regularly $7 each, so $3.50 on half–off day. I love the pink and navy color schemes of these, and I’ve been wearing them open over maternity tanks all summer. They’ll work the same way over nursing tanks, then just stick around in my regular old wardrobe . 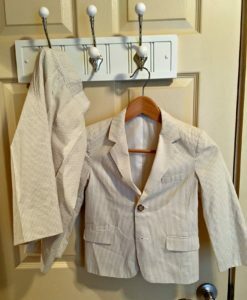 . . probably for years to come, as I’ve had some button–downs since college! What can I say? They hold up well. Check out the seams, see if there are any buttons missing, etc. I stand in a corner and inspect everything—sleeves, collars, whatever. A little trick I learned from Janet is to hold items up to the light to search for holes (especially good for sweaters and dark–colored items). A separated seam or missing button isn’t necessarily enough to keep me from buying an item; if it’s something I can repair myself, I’ll usually go for it. But sweater holes, bleach spots, and serious repair work usually aren’t worth it to me. 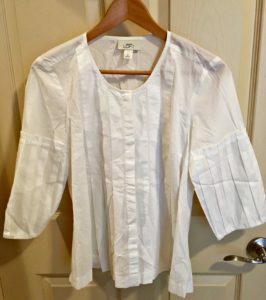 This shirt, originally from Loft, looked like it had been worn maybe once and then hung in someone’s closet for a while. There was actual dust between the pleats! It also had that slightly yellowed look to it that white shirts can get. When I inspected it, I found one loose thread. The tag said $5, so for $2.50, I was willing to take my chances. 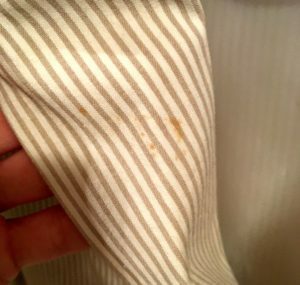 The loose thread turned out to be nothing, and I’m thinking the reason this shirt wasn’t worn much is that it requires a good bit of ironing (those pleats—!). I figured since I get away with doing so little ironing, I could take this one on. Plus, the empire waist meant it worked in my maternity wardrobe for a few weeks. 4. Be willing to take laundry chances. That white shirt was one of those. 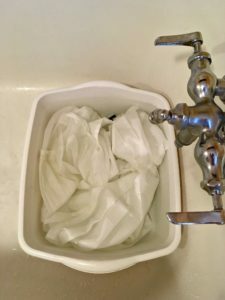 As weird as it is, I really love laundry, and I figured Borax + lemon juice + hot water would be enough to take care of that yellowing. And you know what? It was. I also found this Nautica suit in my nephew’s size. I mean, it is tan and white seersucker, people. Does it get any cuter than that? It was covered—and I do mean covered—in some stain the color of iced tea. I can only hope the previous owner got himself up to his elbows in something delicious. This was another $7 item, so you better believe I decided to put my laundry skills to the test for a $3.50 suit. Remember when I sang the praises of Honest stain remover? It got the job done in no time. 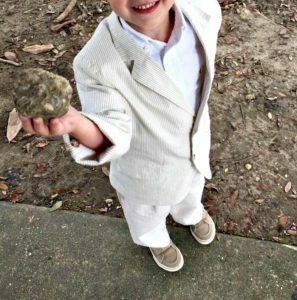 Walk softly and carry a big rock. 5. Don’t be scared of shoes. I know, I know, I know. Thrift store shoes might give you the heebie–jeebies. And honestly, some most of them do the same to me. But there are always a few pairs there that haven’t been worn much and are in great shape. 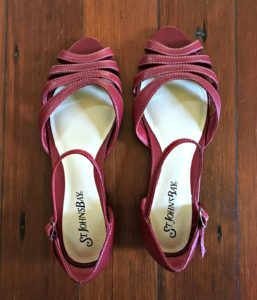 I’ve been looking for cute, comfortable, casual red sandals for a while, and I found this adorable, nearly new pair. I’m not sure these had ever been worn. They still had the original sticker on the sole, and it didn’t look scuffed. 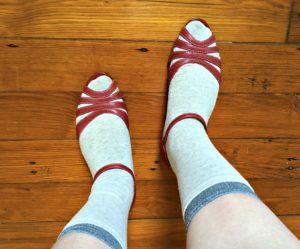 In any case, I tried them on to make sure they fit—always the grossest part!—and they were perfect for leather shoes, the right length and width and just a little tight across the ball of my foot. Oh, and they were $8, aka $4. My usual M.O. with thrifted shoes is to clean them carefully with cotton balls and rubbing alcohol, then wear them around the house with a couple of pairs of socks to get them stretched so they’re nice and comfy. Do I look like an idiot? Yes. Yes, I do. He’s a lucky man, that husband of mine. These quickly became a summer favorite. I’m dying to know—what’s your best thrift store find? I’m thinking mine might be this pair of boots I found years ago. They were the perfect shade of cognac, perfect heel height, sorta slouchy and really comfortable. I wore them until they literally fell apart. They were brand new when I bought them, and I remember Googling them to find that they were still available online for around $200. I think I paid $3. Please share when the thrifting gods smiled upon you!